For over a decade, DJ Jessie Beans has been creating the soundtrack for special events across the greater Puget Sound area. In that time, Jessie has done it all: weddings, wakes, clubs, corporate parties, reunions, ice skating rinks, proms and birthday parties – if music is needed for an event, Jessie will curate the perfect mix for it! Aside from private events, DJ Jessie Beans is best known for playing around the Seattle art scene. She was the house DJ for Seattle’s original indie craft show, I Heart Rummage, where she played monthly at the Crocodile Café and Chop Suey. 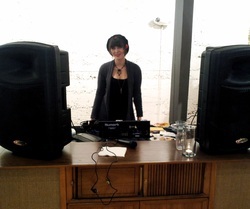 Now you can find her playing her specialty mix of ‘80s, ‘90s, Britpop, Punk and Indie music (always with a few surprises thrown in) at Monster Art & Clothing every month for the Ballard Art Walk and at various other events around Seattle.